Premium Services – Make more of your books! Whether you want an ePub/mobi conversion, individual covers, a professional layout, a complete marketing package or proof reading: with our Premium Services you can improve the visual effect and the quality of your books – and therefore your prospects of selling them. Of course, all services are available for new texts as well as those already published with GRIN. Interested? Please contact us at premium@grin.com or +49 89 550559-0. We will be happy to assist you. The book cover is the first thing your readers are going to see – which is why it is important to have an eye catching design! Our graphic designers will create a professional book cover to match your work. This will not only look amazing, but it will also increase the prospects of selling your book. Take a look at our previous cover art at Pinterest. With this option we will create the cover in cooperation with you and meet your personal wishes concerning the design. You can even provide own pictures or artworks. If you are not satisfied with our first draft, we will offer you an alternative version. Within about 7 to 10 days your cover will be ready for your review and – if to your liking – merged with your book and eBook. eBooks are convenient, cheap and available all over the world. To have your book published as quickly as possible on Kindle, Kobo and iBooks we offer you the conversion into the eBook formats of the future. In contrast to static PDF documents, these formats are reflowable und customizable by e-readers and, thus, bring much more comfort for readers. Within about two weeks we will convert your paper to the new formats. For this, we require a Microsoft Word, Open Office/Libre or RTF file. We will assist you in taking the first steps to successfully advertise and sell your books. With our help you can increase your texts’ visibility and draw more attention to your work. We will prepare a professional press release and send it to up to 250 press portals, blogs and social media services, thus drawing the attention of thousands of print and online editorial departments as well as freelance journalists and readers to your title. For an additional price of 89 Euro we will forward the press release to up to 6000 additional news agencies and journalists. Our experienced editorial team will compose a blurb for you that will meet all professional requirements. The text will of course reflect the content of your book in a favorable manner. Furthermore, it will be search engine optimized so that your publication will be more easily found by search engines such as Google or Bing, but also on Amazon (SEO marketing). This professional advertising text will be printed on the back cover of your paperback and will also appear as the product description on all online shops. As soon as your text is published, we will present it on Facebook and LinkedIn to thousands of followers. The post includes a short text, your cover, and direct shop links. Additionally, we advertise your post on Facebook, giving your book the opportunity to reach its specific target group. With this direct marketing package we give you crucial tools to prompt reviews on your books, for example in magazines. We will provide you with a PDF extract and reader’s copy, a cover file and a fact sheet with all important information on it. Furthermore, you will get a PDF guide with more valuable marketing tips. This will help you to learn how to actively advertise and sell your books on your own. 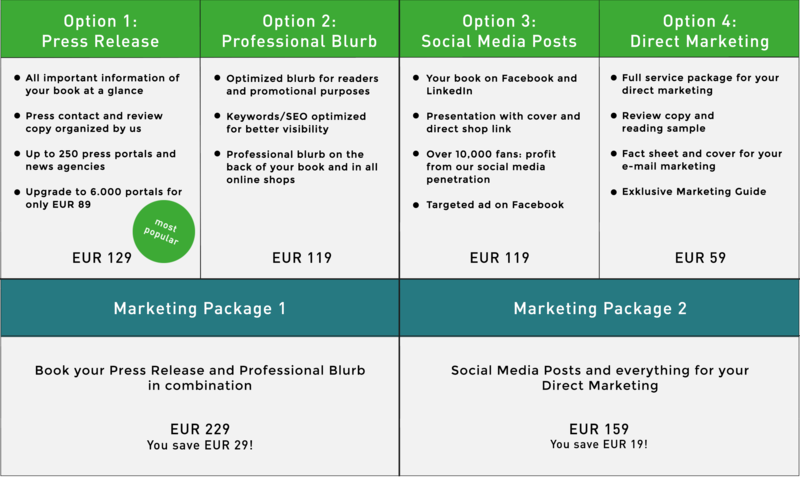 With the Marketing Package 1 you will get the Press Release and the Blurb together at a special price. You save 29 Euro. With the Marketing Package 2 you will get the Social Media Posts and the Direct Marketing together at a special price. You save 19 Euro. We have prepared 6 optimized layout versions which are distinguished by their combination of headings, fonts etc. Choose one of them and we will finish the rest. The conversion of your paper will take 5-7 days, depending on the length and complexity of your text. Here we work together with a typesetting agency which will typeset your text professionally. The costs will be determined by the complexity of your contents. Contact us – we are happy to make you an individual offer. We work together with professional proofreaders who have years of experience and who will thoroughly check your text for mistakes. The costs will be determined by your writing syle as well as the complexity of your book.